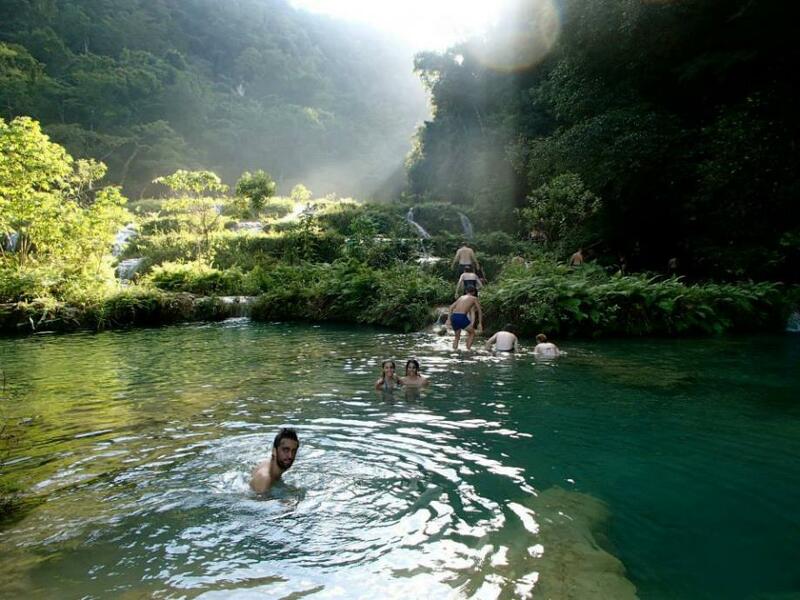 I had been told the turqoise-coloured pools of Semuc Champey are very beautiful, but in no way did I expect it to top my list of best experiences in Guatemala. Semuc Champey is a little slice of paradise at the heart of Guatemala’s jungles that is a bit difficult to reach: it takes a very bumpy ride by pick-up truck through dirt roads winding through the mountains. The ride is quite an experience in itself, and standing in the back of the truck you will get some wonderful views of the surrounding nature. As we went further into the jungle by foot, it struck me just how detailed the forest is here. It seemed like every tree had been meticulously embellished by a movie set designer with patches of moss, fungi, orchids and liana vines. But no, this isn’t a set from Indiana Jones… it’s a real place. 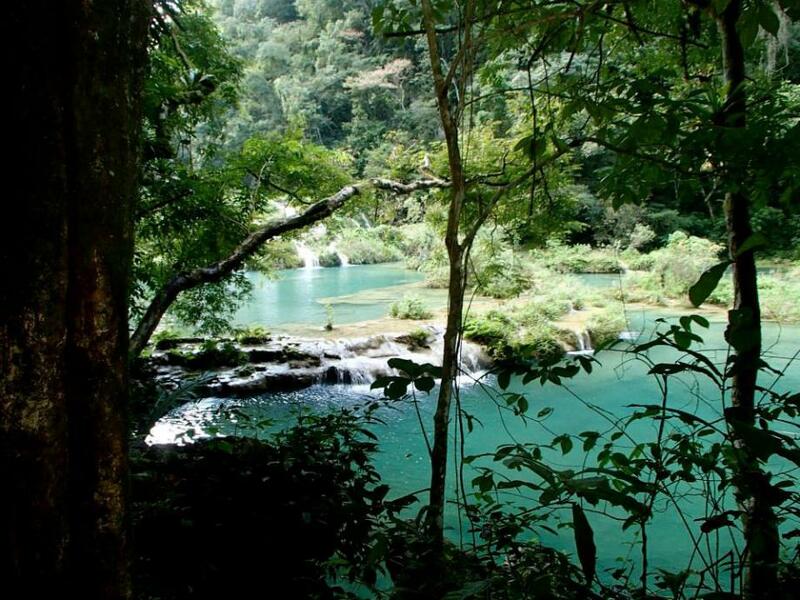 While the blue-green pools of water are the main attraction at Semuc Champey, our guide first took us to a nearby cave. I have explored quite a few caves before but this was something quite different. And since much of the cave is flooded, it sometimes meant having to swim with one arm while holding a candle up in the air with the other. Those who don’t like to get their hands dirty should definitely not go on this tour, but those with an adventurous spirit will absolutely love it. It would be a shame to spoil the little spelunking challenges that await inside, but let’s just say I had to clench my teeth once or twice. After two hours in the cave we had some lunch outside, followed by a brief hike up to a look-out point. And there we finally saw the beautifully coloured pools down below. We got back down to the river by way of a slippery hike, and it’s here that a gorgeous waterfall revealed itself at the top of the pools. We were just there at the right time as rays of sunlight came through the trees giving the whole place an ethereal feel. Our guide took us swimming through each of the pools, which at times looked like a garden of Eden. Riding moss and rock slides over the falls, we gradually made our way into the pool belows. Again there were a few little surprises along the way courtesy of our guides (ones that are better left unspoiled). By the way, prepare for a free fish pedicure as little fishes will almost certainly be nibbling at your feet! I had seen some images before of Semuc Champey and expected to see just a pretty waterfall, but I was not prepared for its sheer majesty in reality. And what I thought would be a quick sightseeing stop turned out to be a day-long caving, climbing, hiking, swimming and rope-swinging experience that left me very satisfied (and tired!). 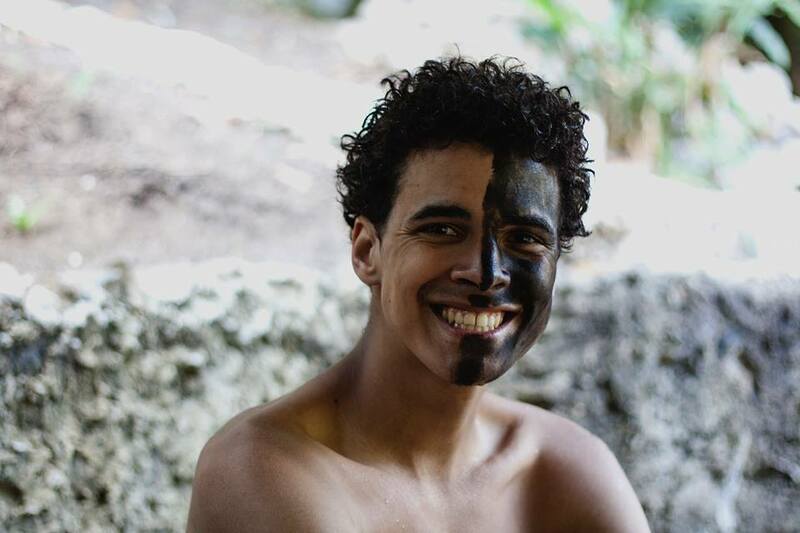 If you decide to visit (which you definitely should) be sure to take a tour; the guides add real value as they will show you a few little secrets in the cave and pools that you would otherwise miss. 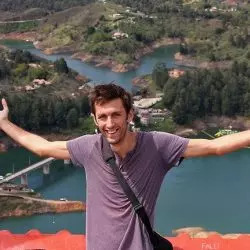 By the way, if you are going to stay in nearby Lanquin, I highly recommend the El Retiro hostel, which is in a peaceful riverside location and has an amazing communal buffet every evening. Just after I got out of the cave. 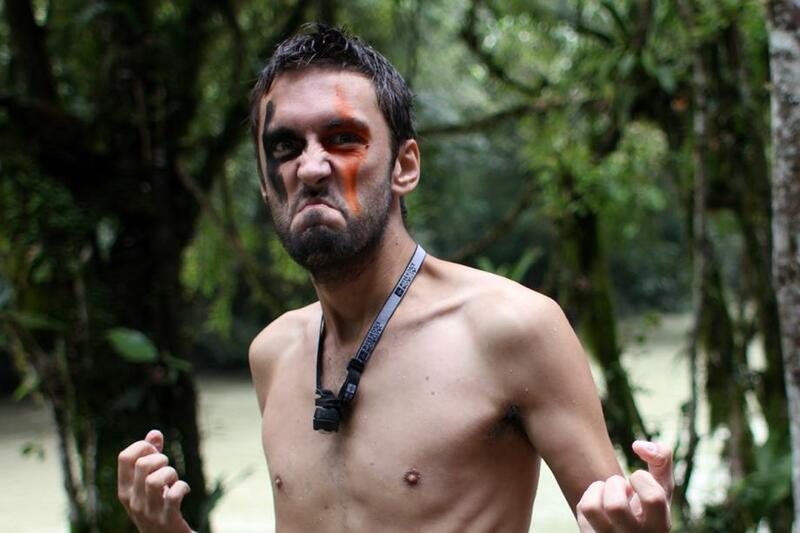 On my face is some red plant juice and some dirt from a cave wall … shortly afterwards I wrestled a bear! Great work on this! I think you just persuaded me to choose Guatemala as my base for 10 days off this coming Fall 2016. Quick question, what was your map or route you followed? Where’d you start and end? How much time +/- in each destination? Cool post! 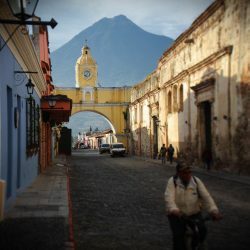 This will be added on our itinerary through Central America (www.bruinenblond.nl). How did you get to El Retiro? Possible to stay overnight? 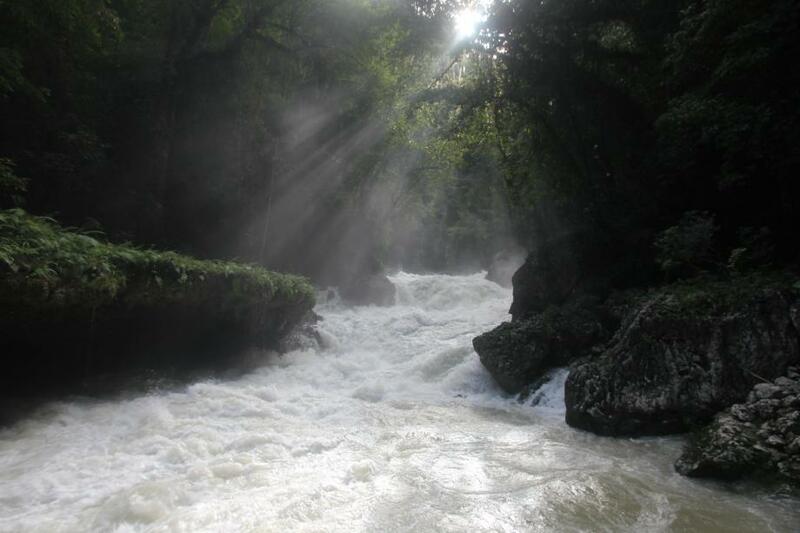 Have you traveled to El Salvador? 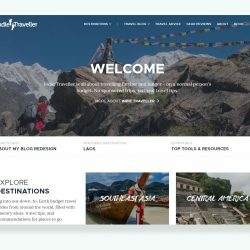 How do I got about finding a guide for Semuc Champey such as the one that helped you guys out? How much did it cost? I booked it at the reception of my accommodation which was El Retiro (nice place to stay). Ask around in Lanquin and you should be able to get a guide easily. Sadly, I forgot what it cost. 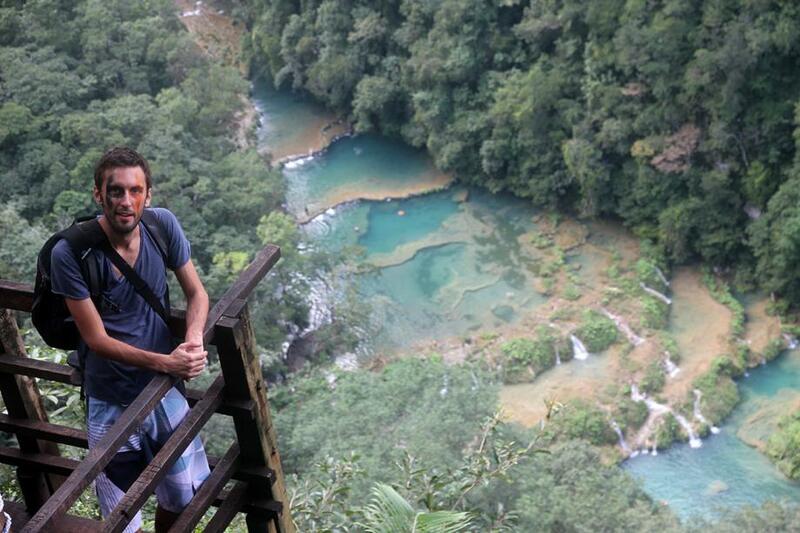 Hey, I’ve been to Semuc Champey last year! Really amazing experience. I reckon I was afraid of going in the caves (self-proclaimed claustrophobic, whenever it suits me really..) but I definitely do not regret it! Hey, where did you get there from and do you reckon it is possible to get there from Flores? Thanks! There are buses from Flores down to Lanquin. Takes about 6 hours if I recall correctly. Thanks for a wonderful post about my country! I always wondered if it was just me thinking that Semuc Champey is a magical, almost religious experience that can neither be described or caught in pictures : you totally have to be there! I live in FL now and am dying to go back but reading your post I am thinking that this trip might not be the best idea with two small kids in tow, so I might just have to do it kidless or wait a couple of years so kids are older. Great pictures and awesome info. Thanks! Woah, this look incredible! 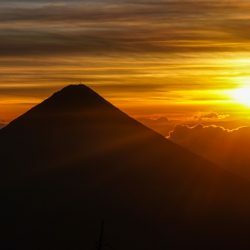 Glad to have stumbled upon this post as I am currently planning a trip to Central America. Definitely adding it to my to-do list.